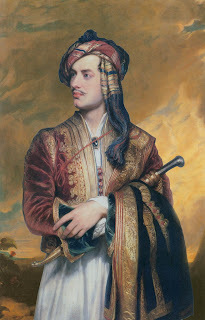 Lord Byron was born January 22, 1788, and died at the age of thirty-six in Missolonghi, Greece on April 19, 1824, (the day after Easter Sunday) during the Greek War of Independence. The poem below was his last . . . . written as an entry in his journal on January 22, 1824. On this last day of my own 36th year of life (I was born February 15, 1976), I see many parallels of thought between myself and Lord Byron at this time in our lives. It may seem odd to some for someone to reflect back on one's life at the young age of 36 in such a way as this, but as Lord Byron stood on the battlefield in Greece he realized that the love which burned within him he could not share with a lover to his delight. By the time Lord Byron reached 36, he had innumerable lovers, a spectacular failure of a marriage, and both fame and notoriety. Now he was lonely and did not want to die alone, and somewhat envious of those who had found love in their lives. Yet seeing and being moved by the heroic actions of the Greeks, he shakes himself out of his longing and desire, the thoughts of feeling sorry for himself, and perhaps his sense of failure that love had passed him by, with the thought of dying an honorable death like those around him. It is almost prophetic that Lord Byron, the great romantic and lover of many, willfully chooses here at his relative young age to die a heroic death rather than live a life of sensual pleasure so available to him. Lord Byron seems to show in this haunting poem that the determination of success in one's life is how the individual perceives it, and for him it appears to be, ironically, one of sacrifice. Reprinted from Works. George Gordon Byron. London: John Murray, 1832.